Amtrak this week provided a preview of the interior of its new Acela Express fleet that will operate on the Northeast Corridor. The train’s prototype is being made by IAM DL 19, Local Lodge 2741 members at Alstom’s manufacturing plant in Hornell, New York, and will be completed in 2019. The first train is slated to enter service in 2021, with all 28 units slated to enter service by the end of 2022. In 2016, Amtrak announced plans to invest $2.45 billion in Acela Express service along the Northeast Corridor, including a contract with Alstom for the 28 high-speed trainsets. This contract also brought approximately 500 new members into the IAM. The new trainsets will accommodate up to 386 passengers, marking a 30 percent increase over existing Amtrak trains. 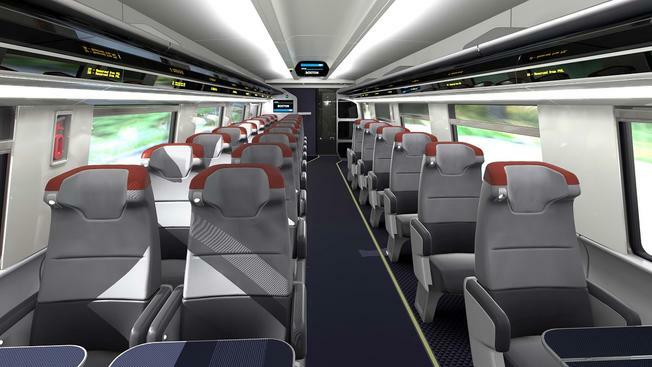 They will also provide riders with a more comfortable traveling experience with many upgrades, including more spacious leather seats with lighting, seatbacks that will have handles to aid travelers to walk through the train and larger bathrooms.